BrowseBurst is the PUP that uses misleading techniques to prevent removal. Use Reimage to locate malicious components and get rid of them faster than with uninstall instructions. A full system scan blocks virus reappearance and prevents traffic to malicious domains. How can BrowseBurst hijack my computer? How to remove BrowseBurst virus? BrowseBurst is a program, which was labeled as adware or potentially unwanted program. The most important reason why security vendors have decided to do that is its dubious activities that are mostly initiated behind user's back. In most of the cases, BrowseBurst promises to enhance users' browsing experience by displaying coupons, discounts and comparison deals when they are visiting online stores. Sounds great, right? Unfortunately, we are not so sure about that. 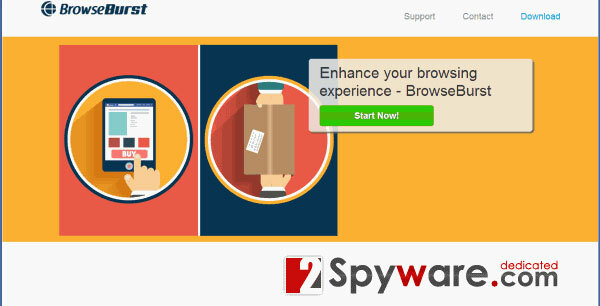 If BrowseBurst hijacks browsers, there is a high chance that you will experience all sorts of irritating and distracting advertisements. Besides, it may also initiate annoying redirects, slow down your browsers and initiate similar activities. After a small research we have discovered that this questionable extension belongs to the company, which is called SuperWeb LLC. This company is a well-known developer that has released tens of similar applications that have initiated various discussions on the web. If you noticed BrowseBurst ads on your computer, it means that this program has already infiltrated it. Click Start -> Control Panel -> Uninstall a Program. When in the Add/Remove Programs/Uninstall a Program, look for recently installed/unfamiliar applications, such as BrowseBurst and similar unknown entries. Open Internet Explorer, click the Gear icon or ‘Tools‘ -> 'Internet Options'. Go to the 'Reset Internet Explorer settings' -> 'Delete personal settings' and click on 'Reset' option. Finally, click 'Close' and OK to save the changes. Open Mozilla Firefox, go to the 'Help' section -> 'Troubleshooting Information'. Click the Chrome menu button on the Google Chrome browser, select Settings -> Show Advanced Settings. Here, look for 'Reset browser settings' button. Click 'Reset' to complete this task. Scan your computer with Reimage or Malwarebytes MalwarebytesCombo Cleaner. This will help you to make sure that your system is free of malicious files and folders. This entry was posted on 2014-04-23 at 08:30 and is filed under Adware, Viruses. You can quickly scan the QR code with your mobile device and have BrowseBurst virus manual removal instructions right in your pocket. How did you remove BrowseBurst virus?